During this year’s Spring Festival, the most important holiday for Chinese people, around 6 million Chinese tourists celebrated the lunar New Year abroad, spending a total 90 billion yuan ($13.8 billion) overseas. The new record not only proves Chinese people’s ability to consume, but indicates the strength of RMB since more payment platforms in overseas markets now accept China’s UnionPay cards. But what stands behind the strong RMB is a prospering China. Since the beginning of the new century, the rise of China, a country with a population of 1.3 billion, has become one of the biggest events in the world. How should this rise be viewed? As long one does not see it through a colored lens, one can find that China, by providing ideas and proposals, taking advantages of its capability and shouldering responsibility, delivers full-bar positive energy to the whole world. First of all, China contributes to the world’s peaceful development with ideas. From an ancient philosophy of harmony in diversity to Chinese President Xi Jinping’s concept of a community with a shared future for mankind, all of those ideas show that China is a peace-loving nation. More specifically, China highlights non-confrontation when forging a new model of major-country ties with the U.S. When developing its neighborhood ties, it upholds a philosophy of “amity, sincerity, mutual benefit and inclusiveness”. When it comes to the China-E.U. partnership, it also places “peace” as a top priority. Secondly, China contributes to reform and innovation throughout the world with its capability. On the eve of the Spring Festival, a video clip recording that an overpass in Beijing was completed in two days triggered heated discussion among foreign netizens. The efficiency of China’s construction amazed them. As a matter of fact, despite the slowdown of economic growth, China is still rather confident in its ability, which is fundamentally driven by reform and innovation. The past three years have witnessed China’s endeavors in fighting corruption, tacking tough issues and the wide-scale streamlining of administration and delegation of power. Such efforts demonstrate the great potential and vitality of China’s reform and innovation. Thirdly, China contributes to win-win cooperation with its proposals. Currently, human society still faces many common challenges. As the biggest developing country and the world’s second largest economy, China is more capable of and willing to play a role in international affairs. The world should be able to feel the sincerity of Chinese people. While aiming for win-win results, China’s proposals, including those on global issues such as poverty alleviation and network governance, are all based on cooperation. Even the initiative of Silk Road Economic Belt and the 21st Century Maritime Silk Road, and the China-led Asian Infrastructure Investment Bank (AIIB) were formulated after full consideration of all partners’ concerns. Fourthly, China is a nation willing to shoulder responsibility. A Chinese netizen once described global society as a class, and the five permanent members of the U.N. Security Council as class leaders. 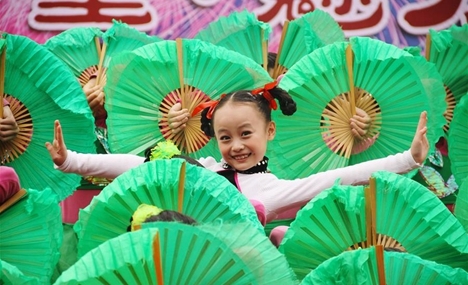 China, as a “poor” student who has made the most advancement , is one of the class leaders. So China shares the responsibility of contributing to the management of the “class” in the spirit of peace and development. China’s role in the U.N. Climate Change Conference in Paris and U.N. peacekeeping operations tells the world that an accountable and progressing China will benefit the entire world. A prospering China has clearly changed the global landscape. However, without prejudice or bias, the world will find that this trend will only promote the global governance towards fairness and justice.